To evaluate physical and mechanical properties of Lapp wire and cable and insure that these products retain critical qualification values of tensile strength and elongation after being exposed to accelerated environmental conditions. These tests are performed to verify compliance with Lapp Mechanical Resistance Cable Attributes, Industry Tests and Safety Agency Standards. 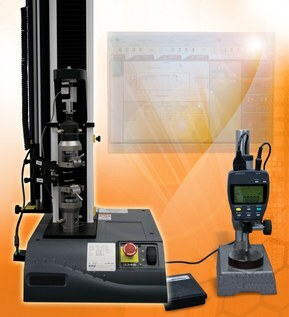 Unaged or aged multiple samples that are tubular or have been die-cut to a specified length are placed within the clamping jaw mechanism of the extenso-meter. The lower and upper mechanical grip are securely tightened to prevent against any slipping or pull-out of the specimen. The sample is then subjected to being vertically pulled at a specified rate of speed which the process is initiated and controlled remotely. The test has been completed once the specimen breaks. Test results are compared to standard requirements electronically to avoid potential error and insure accuracy. To evaluate physical and mechanical properties of Lapp cable and insure that these products retain critical qualification values of crush resistance through gradual and constant compression force. These tests are performed to verify compliance with Lapp Mechanical Resistance Cable Attributes, Industry Tests and Safety Agency Standards. Finished cable samples are marked at specified intervals along the jacket surface to identify compression points. 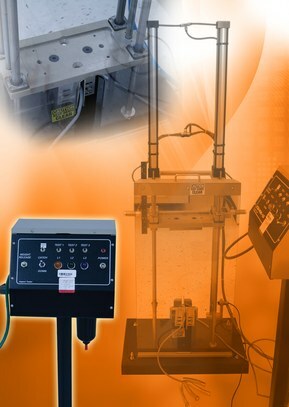 For gradual compression crush testing, both the jacket and insulation of each specimen is stripped and the conductors are connected in series. 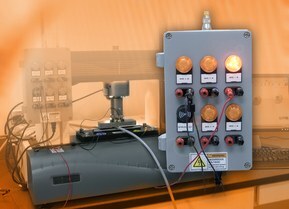 A current source is connected to the exposed series conductors. Audible and visual devices are used to identify any short circuit condition that occurs while under compression, this process is repeated several times. Direct burial specimens are exposed to a constant compression for a certain time interval at which no damage should occur to the cable insulation or jacket upon visual examination. Test results are compared to standard requirements electronically to avoid potential error and insure accuracy. To evaluate physical and mechanical properties of Lapp cable to insure that these products retain critical qualification values of impactt resistance when exposed to a free-fall force. These tests are performed to verify compliance with Lapp Mechanical Resistance Cable Attributes, Industry Tests and Safety Agency Standards. Finished cable samples are marked at specified intervals along the jacket surface to identify impact points. For free-fall impact testing both the jacket and insulation of each specimen is stripped and the conductors are connected in parallel. A current source is connected to the exposed paralleled conductors. Visual devices are used to identify any short circuit condition that occurs while under impact, this process is repeated several times. The test is completed once all points long the specimen have been impacted with the specified weight without the occurrence of a short circuit condition. Test results are compared to standard requirements electronically to avoid potential error and insure accuracy.